Part of the trouble here is that I can’t protect dd from everything–which is every parent’s biggest fear–but part of the trouble is that nothing ever really changes. Kids, not knowing social norms and not having the “filter” that prevents us from simply shouting out all the lovely things we often wish we could say to one another, tend to blurt out mean things simply due to an ignorance of what’s okay to say. Furthermore, kids don’t always have the vocabulary or the emotional strength to know how to express their feelings, so they may channel their own feelings of frustration, hurt, or anger into words that (intentionally or otherwise) frustrate, hurt, or anger others. It’s the gift that keeps on giving. And boy, do I wish this were one that we could cure with a quick round of penicillin. Only one girl wanted to be my friend in 2nd grade, and our best friendship would last all the way through our senior year of high school. She was my rock, the one reliable person that I knew I could count on to be nice. The majority of the rest: well, let’s just say that I learned pretty early on how rude kids could be. Jokes about my weight. Jokes about my appearance. Naturally, the very same kids that would tease me relentlessly were also the ones who wanted to copy off my papers; having the only partially formed self-esteem of a young kid, I didn’t yet have the spine to tell them exactly where they could shove their own homework. As the years passed, I figured out what I was worth–what I deserved and didn’t deserve. 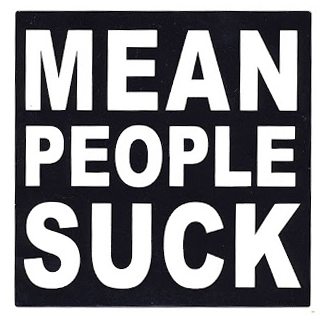 It took me YEARS to get to the point where I understood that when people are mean, it often says more about them than it does about the people who they’re being mean to. I guess the years have passed for the others, as well. There have been various noises from members of my senior class around trying to get everybody together for a 25th year high school reunion. The voices have smoothed out a lot, as time and experience have aged us past the crap we all put each other through lo those many years ago. When I look back at the people who said nice things or who “liked” my post to the reunion page, I see the names of people who were both friends and foes. We’ve all aged out of the awfulness, I hope. And so I sit, wishing I could speed things up for dd or at least protect her from the awfulness that I know she’ll have to go through over the next few years. She’s many things that I wasn’t at that age. She’s gorgeous. She’s popular. She’s athletic. And she’s so blissfully unaware of how incredibly cool she is. So I can’t protect her from all that’s out there, but I can still give her hugs and kisses and try to comfort her when the wolves come out to play on her psyche. I guess that’s as much as a mom can do, and it’ll just have to be enough for now. This entry was posted in parenting and tagged kids, kids can be real jerks sometimes, parenting by crunchymetromom. Bookmark the permalink. Good post :). I wasn’t picked on in HS but I wasn’t super popular either.